Consider the following tips before submitting your Entry for the WIZnet Connect the Magic 2014 Design Challenge. 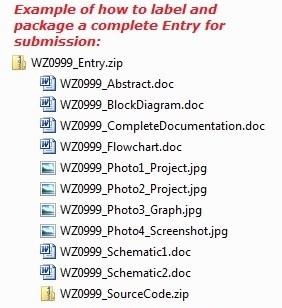 Label your Entry files with your Project Registration Number. Do not include your name or personal information on any of the Entry Files. It’s a good idea to send your complete Entry as a ZIP. Enter via the Entry Dropbox. You can include additional files as well: flowcharts, graphs, screenshots, videos, etc. Short Text Description—Basically, you want to summarize what your project is and what it does (two pages maximum). Make sure you specify which “Eligible Parts” you used. You also might want to highlight any special features of your project. Block Diagram—The block diagram should be a basic diagram showing the connections between your project’s main components. Schematic(s)—The complete schematics must be included. Note: If you use a commercially available development board, then the schematic should show the connections to the identified board and any circuitry you add. Photograph—The photograph must show the complete assembly of your project. If you add text to your photograph, please also send a plain version without any modification. Brief Code Sample—The brief sample of code, or listing, should be no longer than two pages. It should be a short example of your code. Note: You may leave out the sample of code if you don’t have any segments short enough. Formatting—You may submit your abstract in one of two ways: (a) as one Word/text file (no PDFs) with the art embedded; or (b) as a group of files. If you choose option b, be sure to label the files appropriately. Also, put them in an individual folder or a ZIP or RAR file separate from the rest of your entry. The abstract can be a plain document or something fancier with a stylized layout, graphics, etc. Either way is fine. File formats — Please use common file formats that are easily accessible. The formats below are preferred. Questions—If you have any questions, e-mail the Administrator at contest@circuitcellar.com. Our business hours are Monday to Friday, 8:30 a.m. to 5 p.m. EST. If you have a question, we strongly urge you to contact us at least a week before the contest ends. The turnaround time for a reply will be faster if you e-mail us sooner. Any additional photographs, diagrams, screenshots, tables, flowcharts, video, etc. Do NOT put your name on any of your Entry materials. Formatting—You may submit your complete documentation in one of two ways: (a) as one Word/text file, with the art embedded; or (b) as a group of files that the judges can open separately. If you chose option a, also include the original file for the photograph of your project. If you are selected as a winner, we will need a high-resolution image (approx. 300 dpi) that’s approximately 4 x 4 inches. Please do not manipulate or resize the image. The text can be in a plain document or something fancier with a stylized layout, graphics, etc. Either way is fine. What is Code?— You must include the complete source code for your project. This means you must include all of the source files necessary to assemble, compile, or build the firmware for your project. The object/executable code must be able to be recreated by a third party. Formatting—The source code should be packaged and presented as the complete project folder as found on your machine once you are done developing the code. If you provide us the files in this manner, then a third party will be able to build (compile, etc.) your project as required by the rules. What is an Entry?—The term “Entry” refers to your Abstract, Complete Documentation, and Code collectively. After you have created the Abstract, Complete Documentation, and Code, you need to put together your entry. Organization can really make a difference. The information below should help you organize your entry in a way that will impress the judges. Where to Send Your Entry—Enter via the Entry Page. Please make sure that all file names include your Project Registration Number. If you absolutely cannot use the upload process, you can e-mail your Entry to contest@circuitcellar.com or send a CD-ROM, DVD, or USB stick via mail to the address below. Mailed entries must be postmarked no later than 12:00 PM EST on August 3, 2014. Label everything (e-mail subject line, all files, etc.) with your Project Registration Number. Confirmation—If you enter via the Entry page, you should receive an immediate confirmation. If you e-mail your Entry, you should receive an e-mail confirming receipt of your Entry within two to three business days. E-mails are usually sent sooner, but processing may take up to three days. E-mail confirmations will be sent during business hours (Monday to Friday, 8:30 a.m. to 5 p.m. EST). Note: If you send your entry at least a few business days in advance of the Entry Deadline, it gives us time to check your entry for corrupt files and completion. If your entry is missing something (e.g., a block diagram), you would have time to add it before the Entry Deadline. Questions—If you have any questions, e-mail us at contest@circuitcellar.com. Our business hours are Monday to Friday, 8:30 a.m. to 5 p.m. EST. If you have a question, we strongly urge you to contact us at least a week before the contest ends. The turnaround time for a reply will be faster if you e-mail us sooner. Key Elements: Project synopsis, schematic, block diagram, project photo, code snippet, etc. Label with your Project Registration Number. Remove your name. Key Elements: Complete detailed project description, and all project photos, schematics, block diagrams, graphs, code snippets, etc. You can see example Abstracts and Entry files on the webpages of previous challenges, such as http://bit.ly/1b581qM.